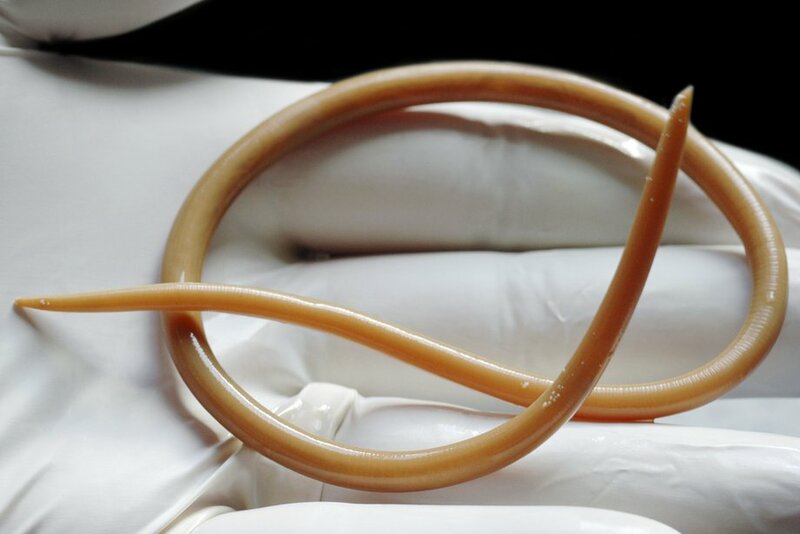 Roundworms can infest the human gut, where they live, feed and reproduce. They don't often cause any symptoms, but are more likely to in large numbers. A roundworm infection – also sometimes known as ascariasis or ascaris – is usually easy to treat. Roundworms are parasites. They use the human body to stay alive, feed and reproduce. A roundworm infection doesn't usually cause any noticeable symptoms. People usually see their GP because they've seen a worm in their stools (faeces). Less commonly, symptoms can include a high temperature and dry cough 4-16 days after swallowing the eggs. If a large number of eggs have been ingested, or if the worms move from the small intestine to other parts of the body, they can cause serious complications, such as a bowel obstruction. However, in England, these types of complications are rare. Read more about the symptoms of a roundworm infection. A roundworm infection can occur if you swallow the microscopic ascaris eggs in contaminated food or water. It's also possible for eggs to be transferred from your hands to your mouth after touching contaminated soil. After the eggs mature into adult worms, the worms produce more eggs. The eggs are released from the body through the bowel, and can then infect other humans. The more roundworms there are inside your body, the worse your symptoms are likely to be. Read more about the causes of a roundworm infection. See your GP if you notice a roundworm in your faeces or you have unexplained asthma-like symptoms shortly after visiting a tropical or sub-tropical country. A roundworm infection can be diagnosed by examining a small sample of faeces under a microscope. Infection is confirmed by the presence of eggs or a worm in the sample. Roundworm infections can usually be successfully treated with medication. Read more about these medicines in treating a roundworm infection. Regularly washing your hands can help prevent the spread of a roundworm infection. You should take additional precautions if you're travelling to a part of the world where roundworm is common, such as only drinking bottled water and avoiding raw fruit and vegetables. These are the same precautions that help prevent many other infections associated with poor sanitation. Read more about preventing roundworm infections. Soil-transmitted worm infections, including roundworm, are among the most common infections worldwide. They affect poor and deprived communities, where there is overcrowding and poor sanitation. It's estimated that about a quarter (24%) of the world’s population currently has a soil-transmitted worm infection. Infections commonly occur in tropical and sub-tropical areas of the world, including in sub-Saharan Africa, the Americas, China and east Asia. Most recorded cases of roundworm in England are contracted abroad, either by travellers or migrants who come from parts of the world where roundworm is present. In England, Wales and Northern Ireland, an average of 80 cases of roundworm infection are reported every year.